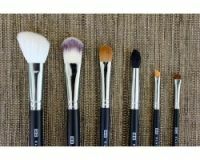 These brushes are amazing quality, perfect for any job. As a special effects artist, I rely on them for various applications and they never fail! These brushes are amazing! They blend all my make up on so well and the best part is they don't shed!! The other brands I used to use would shed all the time and I would end up with brush hair all over my face. This is not the case with Elaina Badro brushes. Great quality for a great price!! Love these brushes! I have really sensitive skin and Elaina Badro brushes is so smooth and silky against my Skin, esspecially in the cheek area because I wear alot of bronzer! Highly recommend these brushes for people who wanna use something very gentle while still trying to achieve the look you want.